Nevada City, California, April 05, 2018 – At NAB 2018, booth SL3316, Telestream®, a global leader in media streaming and delivery technologies, video service assurance and file-based media workflow orchestration will showcase a strategic upgrade to its end-to-end multiscreen video monitoring and analytics solution. 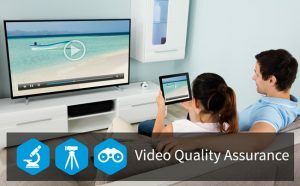 Telestream reports that the enhancements to its ABR monitoring solution bring significant benefits to content owners, broadcasters and online video service providers seeking to offer the best possible Quality of Experience (QoE) to consumers as they watch content on the broadest range of devices. Amongst the new functions announced within Inspector LIVE and Surveyor ABR Active is a new open API that can be used for configuration, control and data extraction. This is a key enabler in Network Functions Virtualization (NFV) environments as well as in container orchestration and automation environments. The probes also feature new user interface (UI) and monitoring workflows which enable operators to identify the critical metrics faster through an ability to customize the UI according to their specific requirements. Inspector LIVE 5.0 is a content monitoring probe that is capable of monitoring video quality pre and post encoding or transcoding for hundreds of programs. It ensures the encoder is properly configuring all asset variants for delivery on ABR networks. In addition to an open API and new UI, a new enhanced perceptual quality metric within Inspector LIVE offers support for new data types – such as HEVC encoded content – and new deeper analysis of all data streams to the pixel level. By enabling network operators with the ability to support and maintain end user QoE more efficiently, these new capabilities reduce the amount of time to resolve issues which ultimately reduces consumer churn. Surveyor ABR Active is an adaptive bit rate QoS probe that offers visibility of protocol conformance, accessibility to content and video streaming performance across a diverse range of networks. It allows users to monitor and isolate issues by location, across various delivery network points including CDNs, last mile networks and access points. With Surveyor ABR Active operators can also schedule monitoring for special circumstances such as prime time content, live events, peak times and corporate events.